I see a 10 fold drop in performance, not the relatively small drop that they see. So maybe my phone is defective in some way. The latest conspiracy theory is that Apple intentionally altered the signal strength to bar formula so they'd appear to have a better signal than other phones. I really don't give a toss what the signal bars indicate, it is the data throughput that matters and with my iSpot covered it is a ~10th of what it should be on my iPhone 4. I wonder... Is there a chance that they deliberately throttle the data bandwidth based on the number of bars? In other words, could the reported drop in data throughput still possibly be due to a software bug in the bars calculation? Or maybe the stuff they're saying about the bars calculations is actually an oversimplification of the more complicated issue of baseband frequency switching that some have suspected might be causing the problem. I'm still at a loss of what to do as well. I was just using the phone at my desk with the bumper case, and still had it drop from 5 bars to 3. Running a speed test again shows that the case is helping a bit, but not a ton. My download speed was cut in half, and upload down to 1/4th the normal speed. Considering how close the tower is to my office, this is going to be much worse elsewhere. Is there a chance that they deliberately throttle the data bandwidth based on the number of bars? In other words, could the reported drop in data throughput still possibly be due to a software bug in the bars calculation? - release the "death grip"
Just out of curiosity, do things improve at all with a small strip of clear tape applied over the iSpot? I'm wondering how much "physical contact" matters relative to "physical proximity" -- the tape should make that easy to distinguish. This would tend to indicate that it is indeed some kind of a software issue, where the system is only throttling the bandwidth (or switching frequencies) after a short hysteresis timeout, based on some perceived indicator of reception issues, rather than actual loss of signal. I'm really curious to see if the software update takes care of it. Tom tried a Post It note and that was sufficient to not cause any issues if you touched that spot. I tried a bit of electrical insulating tape, which didn't appear to help. A tea towel however was enough to solve the issue. Also a thick rubber band worked. However I have also seen people report that the Bumper didn't work to solve the issue for them. This is true of iPhone 4, iPhone 3GS, as well as many Droid, Nokia and RIM phones. That just bugs me. Droid phones? I guess if you have an Android device on another network you don't have this issue. "[the]* iPhone 4 and 3GS have this issue"
"many Droid phones have this issue"
Using this logic, Apple's two latest generations, essentially all the phones they're developing for, have antenna issues, but you can buy a Droid phone that doesn't. I'm just saying, perhaps Apple's PR isn't as great at attention to detail as other teams in the company (except for the antenna team - ooo burn!). * I out and out REFUSE to refer to it as "iPhone," as in "iPhone 4 has great reception." It's "THE iPhone 4 has great reception." It's not a f**king person, damnit! Steve sounds like a totaly d-bag every time he says that. I got a chuckle out of "Since this mistake has been present since the original iPhone, this software update will also be available for the iPhone 3GS and iPhone 3G." The infamous barPhone was reported to have been disguised with a wrapper. I could see Apple not recognizing the scope of the problem it that was commonly, how the prototypes were handled. Well I took my iPhone 4 to the Genius Bar at the Apple Store today. You can go and read all the gory details if you want, but in summary: my iPhone appears to be typical, a Bumper solves the issue, no free Bumper offered, customer left angry and frustrated. No, I, for one, am interested. How long do you have to return the phone? Is the update going to come out before that? Personally, I think I'd return it on principle, even if I were to just buy it again if and when they fix the problem. As Bitt suggested, I'd return it. It's the clearest message Apple is going to get on this issue. Being in the UK I have the might of our much derided, expensive consumer laws behind (by people in countries with little consumer protection in the country). I don't expect to have too much trouble returning it if I choose to if the update doesn't resolve it. I did check with the store manager if he thought I'd have any hassle. He said 'come in and ask for me', and gave me his business card. I have no reason to doubt his sincerity. I hadn't considered returning it as a temporary measure, it seemed like a very final action to me. It would mean losing some money though as every day I can't sell my 3G it is going down in value. I'll give it some thought. I'm still debating what to do myself. My 3GS doesn't have much resale value currently due to some glass damage, so for me it's not too much of a concern if I go back. I would however miss the iPhone 4 features, as it's really grown on me already. I have a trip coming up, and I think I'll make a final decision on returning or keeping it after that. I am going to return the bumper case though. I can't plug the iPhone 4 into my temporary speakers in the car with the bumper on, nor can I plug it in via the dock connector. Plus it's nearly caused me to drop the phone already, due to the rubber gripping the inside of my pants pocket as I'm removing it. I am going to return the bumper case though. Speaking of iPhone 3G (not 3GS): Has anybody else noticed that things have gotten decidedly slower with iOS 4? Yesterday, I tried using the camera, and it took something like 30 seconds to actually be ready to take a picture, by which time the thing I wanted to shoot was long gone. I'm sure it's much better with a 3GS or 4, but it's still sad that Apple hasn't managed to keep up the performance on their older models. I'm hoping that the Android people do better with this sort of thing as their platform evolves. Certainly, they seem to have made real strides in performance from Android 2.1 to 2.2. My 3G definitely has some sluggishness on iOS 4.0 in some areas, some of the time. Some things seemed to be a bit quicker too. I've just mailed mine off to a recycling company, which I guess means I'm keeping my iPhone 4 for now. For those in the UK, quidco.com are offering £100 cashback on the 12 month £15 iPhone simplicity tariff. If you are a low minutes user like me then that is quite the bargain, £80 for the year overall! It will mean the iPhone4 will cost me £580 for a year, not too bad I don't think, especially with the added bonus of keeping my number and being SIM free at the end. I've noticed increased sluggishness with my 3G phone with each successive update. The update to iOS4 made things only incrementally worse than the prior update, but I do get the feeling that they are a hair worse rather than better. Note that I did a full clean wipe of the phone instead of a restore (details of that fiasco I think are higher up in this very thread). - If the phone completely locks up to the point where it seems to be unusable, sometimes pulling out the SIM card, blowing on it Nintendo-style, and re-inserting it, helps. I think there's a processor thread that's constantly checking the SIM card, and if there's intermittent connectivity to the SIM, you'll get that thread locking up and causing other dependent threads to lock. This, by the way, is coincident with a related symptom: Sometimes my phone would just say "No Sim". - There's a free app called "Scan" that will free up RAM on the phone. Running that occasionally helps. For instance if I run the app before I run the TomTom navigation app, then the user input prompts on TomTom are more responsive (though still too slow for my tastes). I had the opposite experience, each update over the last 2 years made my 3G feel faster (in some cases measurably so). Excluding 4.0 that is, most stuff got slower then. TomTom was always painfully slow on the 3G though. TomTom is just great on the iPhone 4, faster than any dedicated TomTom unit. Heh. 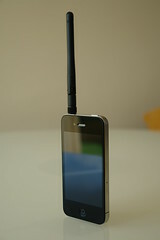 I guess we're a long way from when Motorola thought they had to put a fake antenna on the MicroTAC. iPhone 5-A with optimized reception. Why do you think there was a fake antenna on the MicroTAC? Because a solid plastic rod is not an antenna? Generated in 0.021 seconds in which 0.010 seconds were spent on a total of 16 queries. Zlib compression enabled.